That’s the word iPhone’s autocorrect feature inserted when Steve replied in a text to our friend who had just come from the comedian’s show in Las Vegas. What Steve meant to text was, “Carrot Top is our favourite performer” but he spelled “performer” wrong . After we finished laughing, we immediately wondered…what the heck is an orthoclase? Well, it’s a mineral of the feldspar group, KAlSi 3O8, by the way, and a term, I’m sure, that has never been used to describe the man. A tool, a maniac, a genius perhaps…but an orthoclase? Coincidentally, last night, my sister sent me an email about a website devoted to iPhone autocorrect where people submit laughable autocorrected texts as evidence of texts gone wrong. 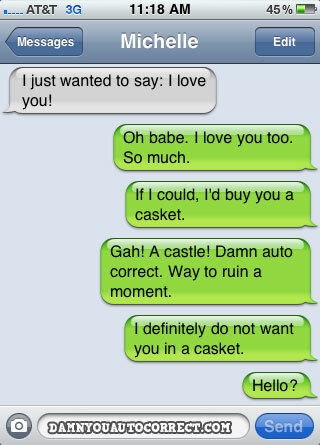 http://damnyouautocorrect.com/ You won’t be able to stop laughing. Good for a Tuesday laugh, or any day of the week! ← Bongo Burger Bar in Sherwood Park – Boffo, blah or blech?